John Yokley was one of the early Harrison Township residents living near Bronaugh and Moundville. He was a Civil War Veteran, having completed outstanding service for the Confederate cause. He continued to be active in Confederate Veteran activities for the rest of his life and was a very successful farmer. Elizabeth: May 3, 1834 - ? 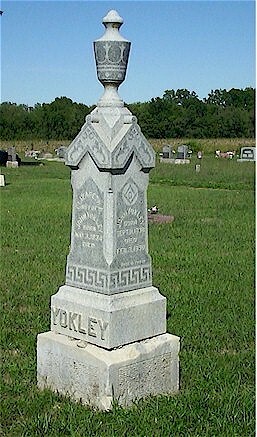 An exact death date of Mrs. Yokley has not been found, but there seems to be some agreement that it was 1893. Her death date is not engraved on the grave marker. No one seems to know if this was an oversight by the family or she was buried elsewhere. The general assumption is she is buried beside her husband. If anyone has a photo of Mr. and Mrs. Yokley, we would like to add it to this page. 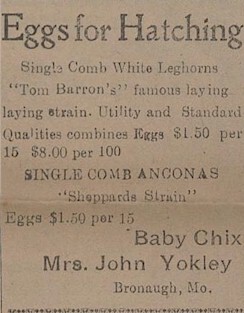 The Mrs. John Yokley who advertised here was the wife of John Yokley, son of Jacob Yokley and grandson of John and Betty Yokley. This is from the September 8, 1920 Fort Scott newspaper Garland items. It listed winners at the recent Garland Fair. Earlier that year, when the 1920 census had been taken, JohnYokley had described himself as a poultry farmer. From History of Vernon County, Missouri. 1887, p. 783. (Farmer and Stock-feeder, Section 15, Post-office, Bronaugh). One among the prominent and influential citizens of Harrison township is John Yokley, who was born in Davidson county, N. C., September 11, 1838. His parents, David and Susan (Shuler) Yokley, were also natives of that State, and by their marriage had a family of four children, John being the second son and child. He grew up in the vicinity of his birthplace to a knowledge of farming, an occupation which he followed in connection with teaming for a number of years, and one in which he was made familiar with the details of the occupation. Leaving North Carolina in 1856, he removed westward, settling in Lafayette county, where he resumed tilling of the soil. September 11, 1857, he was married to Miss Bettie Mulkey, whose birth occurred in that (Lafayette) county, the daughter of Col. Christopher Mulkey. He was a Kentuckian by birth but became an early settler in. Missouri. 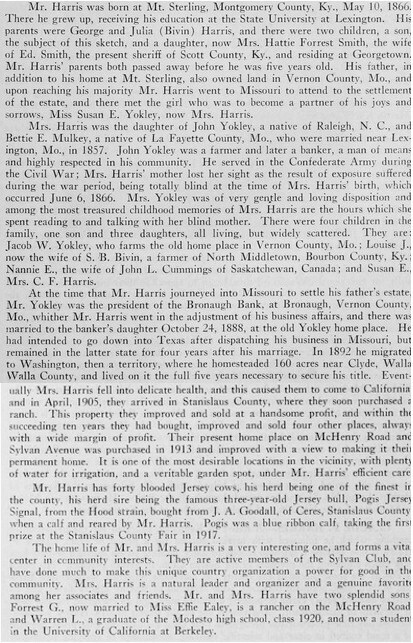 After his marriage Mr. Yokley continued to make his home in Lafayette county for over 20 years, or until 1879, when he came to Vernon County. In the meantime, however, (during the progress of the war he had not forsaken his duty, for early in the conflict he entered the Southern army, Gardiners regiment, of Shelbys brigade, taking active part among others in the battles of Lexington and Prairie Grove, though participating in the engagements in which the command were engaged.) Brief historical reference to his old war horse Bally, is worthy of insertion at this point. This animal was four years old at the commencement of the war, and all through the struggle was ridden by Mr. Yokley in every engagement participated in by the command; he was brought home and is still alive and receives the best of care, being quite a pet in the family; indeed this faithful animal receives the respect of all who served in the late struggle. At the age of 31 he is still in good condition, a fact greatly to the credit of his owner. Mr. Yokley now owns and cultivates 112 acres of land, the improvements of which are neat and convenient. Since his residence in this county he has proven himself a good manager, and has made a success of both farming and stock raising. He is conceded to be one of the leading men in this township  progressive, alive and of a go-ahead nature, and justly merits the place which he occupies in the esteem of all who are favored with his acquaintance. The following is lifted from the biographical sketch of Claude Harris in Stanislaus County, California who married a daughter of John and Bettie Mulkey Yokley. It is being included here because it tells about the blindness of Bettie Mulkey Yokley. It also tells that John Yokley had been president of the Bronaugh Bank at one time. If you have information to share or questions please email us.